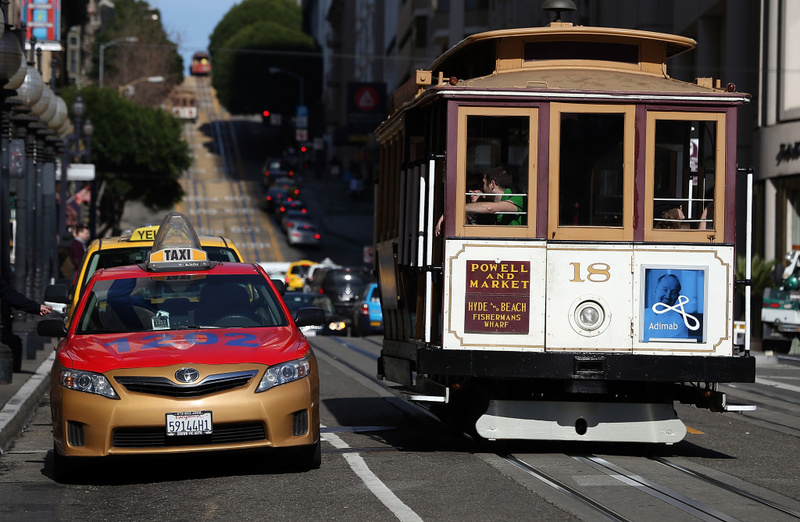 A Cable Car passes a line of taxicabs as they wait for fares in front of the St. Francis Hotel on January 21, 2014 in San Francisco, California. The San Francisco Federal Credit Union is suing the State’s Municipal Transportation Agency (SFMTA) alleging the transit agency is responsible for the downfall of the taxi market. The credit union made loans to taxi drivers to buy medallions that cost $250,000 each; now the suit alleges that taxi medallions have decreased in value because of Uber and Lyft operations. The lawsuit seeks $28 million in damages and wants the SFMTA to pay millions to repurchase all the medallions.